I love trying out new recipes – especially when it involves discovering healthier versions of my favorite meals and snacks. 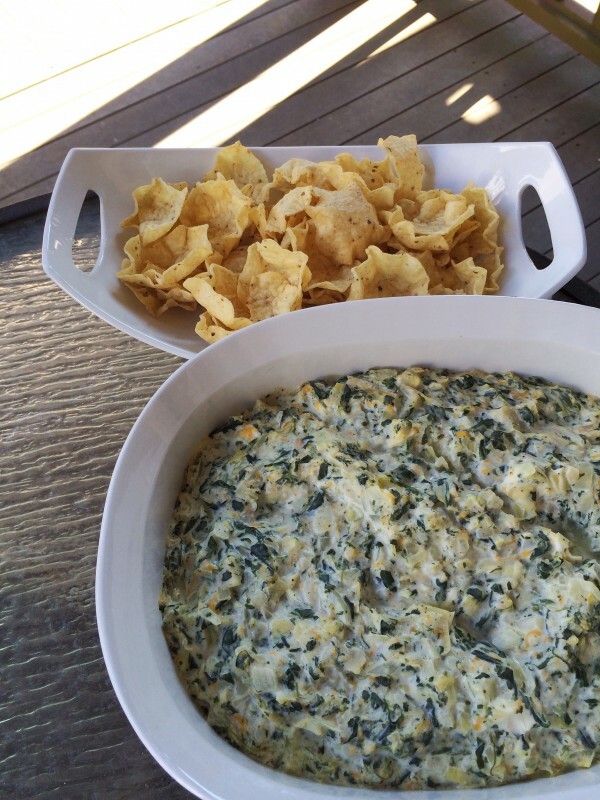 To kick off the recipe section of DailyKaty, I wanted to share my favorite, go-to dip recipe, Hot Spinach Artichoke Dip. This recipe is actually from Weight Watchers, but puts a healthy spin on a classic dip without sacrificing the taste, making it a not-so-naughty indulgence for football Sundays, girls nights, any gathering with loved ones, or even by yourself! The recipe substitutes some of the high-fat creaminess usually found in spinach artichoke dips with lower-fat cream cheese and sour cream, and adds a layer of crunch with sautéed onions and chopped water chestnuts (I know, it sounds random, but it works really well!). Below is a shot from my latest Hot Spinach Artichoke Dip – I actually doubled the recipe to bring to a big family party and put it in two dishes. One of the best things about this recipe is you can make it ahead of time and hold on baking it in the oven until you’re almost ready to serve it. Add onion and garlic; sauté 5 minutes or until tender. Add spinach, water chestnuts, and artichokes; sauté 2 minutes. Add cream cheese, sour cream, 1⁄2 cup of Cheddar cheese, hot sauce, salt and pepper. Spoon into an 11 x 7-inch baking dish coated with cooking spray. Top with remaining 1⁄2 cup of Cheddar cheese. Bake at 350°F for 18 to 20 minutes or until thoroughly heated. Serve with baked tortilla chips, crackers, vegetables or bread. Yields about 1/4 cup of dip per serving. Do you have a favorite dip recipe? If so, share it in the comments for other readers!